The yellow book in the Victorian Times caught more attention despite being different from the favoured genres and works of that time. What added more to the popularity of the book was the yellow shade that had been chosen with an idea to make it look like an ordinary French novel. However, the results were differentiated from what had been expected initially. The main concept of releasing a journal and making it different among the existing ones was based on the format and contents of the upcoming periodical. It was decided that the formal, the text and the content it would contain and convey to the audience will be new in terms of art and literature. 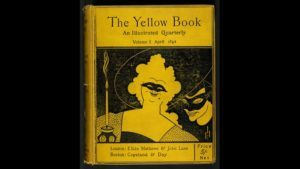 Till the last decade of the nineteenth century, the literature and art were mostly read together as one, and changing this perspective was the main challenge of the journal in yellow. The idea was born among a group of writers as well as painters who met at a French resort and came together with a common thought of change in the world of publications. These people were well known as Walter Sickert, D.S. MacColl, Charles Conder, John Lane who was head of the publishing firm Bodley Head. The other contributors were Walter Crane, Edmund Gosse, Henry James, Sir Fredrick Leighton and yes a few more. 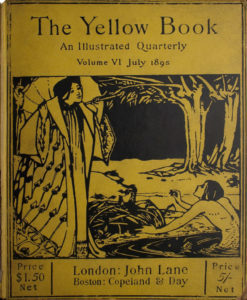 There were other contributors to the literary content of the ‘Yellow Book’ and they were Arnold Bennett, Max Beerbohm, Ernest Dowson, Baron Corvo, George Gissing, Henry James, Charlotte Mew, Richard Le Gallienne, H. G. Wells, Arthur Symons, Frank Swettenham and William Butler Yeasts. 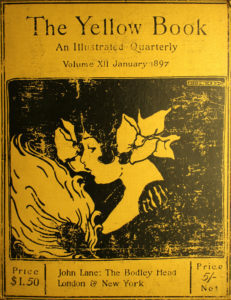 The first editor of the book was Aubrey Beardsley and he enjoys a majority for the credit for the yellow coloured cover of the book being associated with French fiction then. The years when the ‘Yellow Book’ was actively published was from 1894 to 1897. Since this was also the decade when the Victorianism was being made popular among the French and Regency attitudes as well. The popularity of the colour yellow as it held importance throughout the last decade of the 19th century, made it earn the name – The Yellow Nineties. The first print of the book was successfully launched on April 16th in 1894. Since the book was already known because of the new format and type of content with contribution from a long list of writers and artists, the first publication had to go through three printing orders to meet the demand-supply curve. The book was able to gain enough attention from the critics as well and eventually, the promotion was boosted. The book received a special mention in the form of parodies in a magazine which under the name of Punch as a social and political comic on a weekly basis. Apart from this, there were also straightforward criticism which were faced by the book. To match with the critics then two drawings were contributed by the editor, Beardsley in the third edition of the book and they were put under two different names of- Albert Foschter and Phillip Broughton. Now one of the publications who found the works of Beardsley faulty applauded the two drawing in the later edition as drawing of merit and a clever study. Well seems this was the plan behind releasing the works in different names, Beardsley later unfolded the facts of the drawings. Oscar Wilde was among the most well-known play writers of the 1880’s. He is recollected as an Irish poet and writer and had experimented with different forms of writing in his active years. His most famous novel is considered to be ‘The Picture of Dorian Gray’ although the life was lost at a young age of 46 years. Not a single word of contribution was made by Wilde for the Yellow book but yet every discussion of the book incomplete without the mention of Oscar Wilde. Oscar was connected through the friendly terms of his with the major contributors of the book and also because his Salome was illustrated by Beardsley. That was all. When Oscar was arrested, it is said that he held a book with yellow cover and assumed by most of the people then that it was the ‘Yellow Book’. This affected the ties of Beardsley with the book and eventually under pressure was discontinued being associated with the journal. Truth to be told, Oscar Wilde was clutching a French novel with the yellow cover. Yet after all this, the publication of the ‘Yellow Book’ was continued till the year 1897.